Back in the day (not so long ago), when you purchased a riflescope or a pistol scope for target shooting or hunting, you had a choice of simple crosshairs or a red dot. They weren’t hard to understand or to use; what you saw was what you got. Not so today. With the wide range of scopes out there—some of them very expensive—shooters often can’t figure out what all the lines and dots are supposed to mean and do. 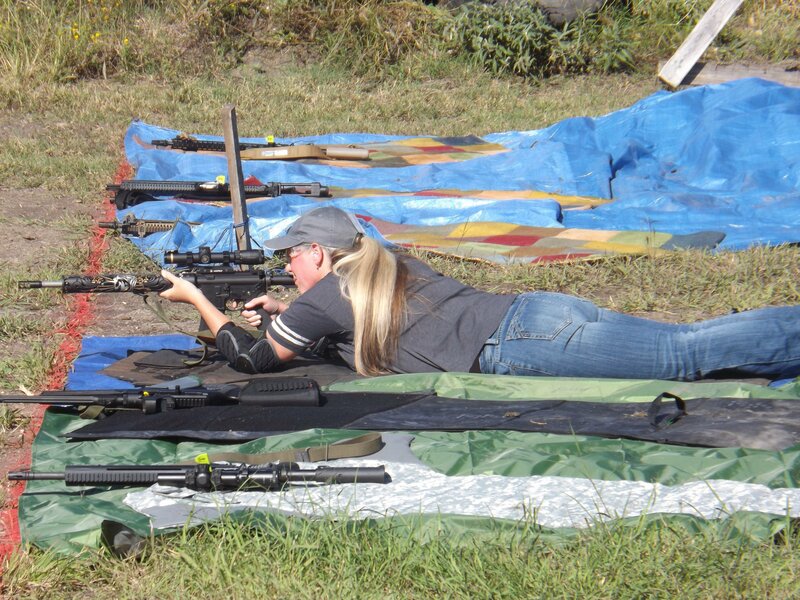 Recently, Women & Guns reached out to Tim Tanker, product manager of riflescopes at Bushnell Outdoor Products, to gain a better understanding of what we see when we look through one of today’s scopes. Tanker gave us an overview of the most common reticle types that shooters are seeing these days, and how they work. Keep in mind that you may see other reticle types when you go shopping for a new scope. You can bet, however, that whatever you see will be similar in form and function to one of the reticles you see here. In the early days of riflescopes, Tanker said, the crosshairs really were just that—crossed hairs. 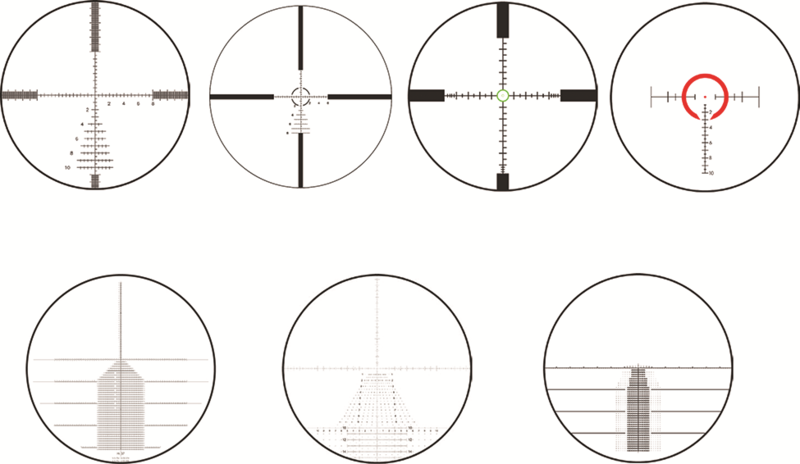 Today, Tanker said, there are two basic kinds of reticles: thin metal wire that looks very much like the original crosshairs, and complex reticle shapes that are etched with a laser on glass. For all the technology out there, one of the most basic reticles still is the most popular. 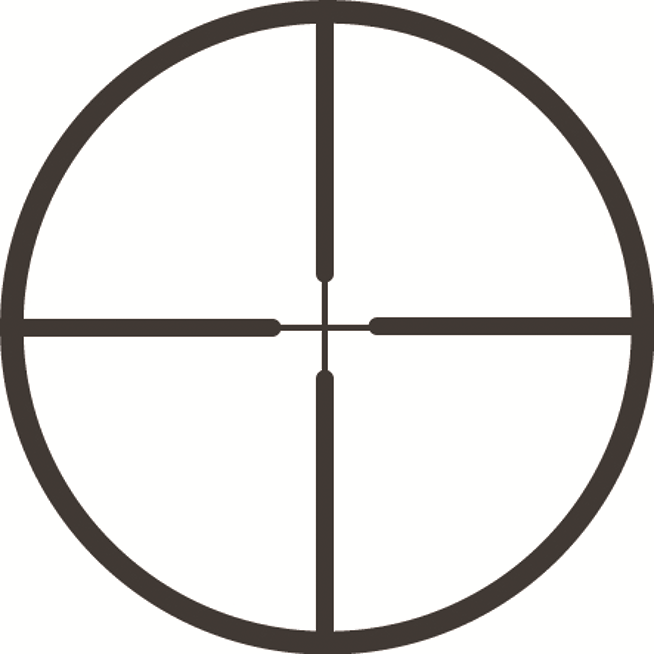 Some duplex reticles, such as the Leupold Dot and Leupold Target Dot, have tiny dots at the point of intersection of the crosshairs to make aiming easier. Simmons calls its version the Truplex Reticle. Duplex reticles work with any caliber and load, on rimfire or centerfire, in riflescopes and pistol scopes, and they’re easy to understand and use. “On the other hand, their effectiveness for long range is limited, and in low light they get hard to see,” Tanker said. “The rule of thumb is that you set your gun 2 inches high at 100 yards.” From there, you’ll use the ballistics chart printed on the ammunition box or the manufacturer’s website, and your estimate of the distance to the target, to compensate for bullet drop. 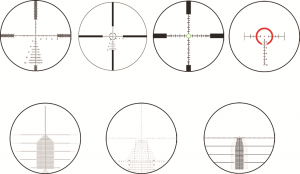 In recent years, as technology has advanced and shooters have demanded better accuracy over longer distances, optics manufacturers have developed Bullet Drop Compensating (BDC) reticles to help shooters compensate for both bullet drop and windage. One such reticle looks like a duplex reticle, but has horizontal bars or dots at increasing distances under the crosshair. Bushnell’s version of this type is the DOA 600 with bars; Redfield’s Revolution reticle uses dots. “On the DOA 600, each one of the bars represents a 100 yard increment,” Tanker said. 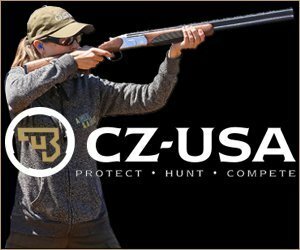 “The shooter zeros the gun at 100 yards and then holds over the target on the correct dot to compensate for distance. If the shooters holds on dot number 3 at a 300 yard target, the shot should be successful. 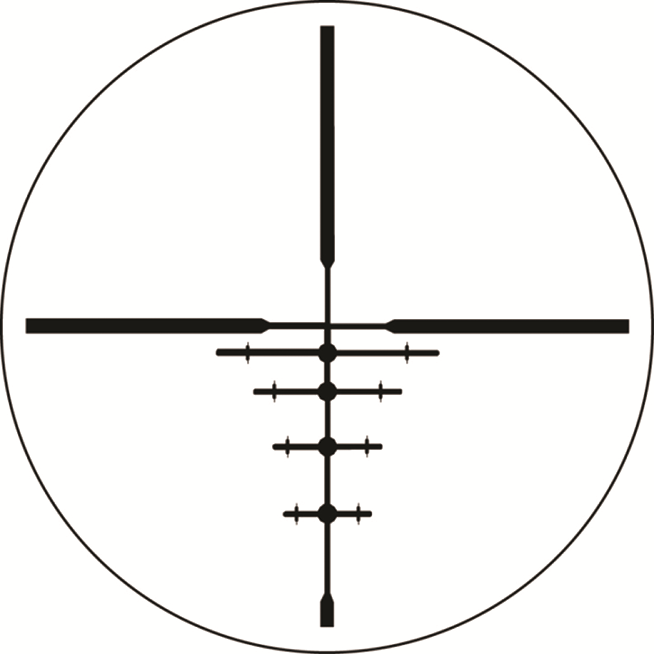 This makes for a lot less guessing than the duplex reticle.” Almost every riflescope manufacturer has some version of this, each one a little different. All of that said, there’s a caveat to this. Not every bullet and every load behaves the same way, and these 100-yard increments are more accurate for some loads than for others. For instance, Bushnell says that its DOA 600 is accurate for 11 loads, including .223 Win 55-grain, .243 Win 95-grain, .25-06 Rem 115-grain, .270 WSM 15- grain, and .30-06 Springfield 150-grain. This is where ballistic tables come into play. By comparing the tables of the ammunition you’re shooting to that of loads that the manufacturer knows are accurate for a particular BDC reticle, you can work up your own numbers for what those holdover points should be. When you start looking at all this new optics technology, though, the whole thing can get a bit complicated. With these first focal plane reticles, the image behaves differently. “As you look at that target image, the reticle on 3 power is very small, and as you increase the power, the reticle grows in size with the target image,” Tanker said. “With a first focal plane design, you don’t need to be on a particular power for the reticle to work; it works on whatever power you’re on.” When you purchase a new plane scope, the box should tell you whether it’s first focal plane or second focal plane, or you can look through the scope and turn the magnification ring to see how the image behaves. Although these reticles may look confusing, Tanker said, once you start to understand them they’re not as intimidating as they seem. 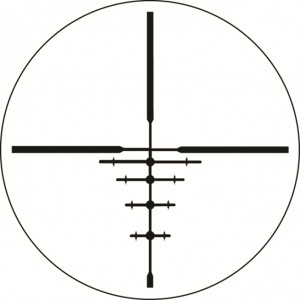 Manufacturers have come up with a number of versions of these mil-based reticles, but they all work on the same concept. Some are illuminated for low light conditions, and some of those have little rheostats on them to control the amount of illumination so you can use them when you’re hunting right at dusk. All of them provide shooters with the ability to compensate for both elevation and wind. Here, again, ballistic information is important. When you understand your load and how it performs, you can use the marks on the reticle to put your bullet exactly where you want it, even at a long distance and with a crosswind. For example, look at the first image of the mil-based reticle.This image shows Bushnell’s G2 reticle, along with the ballistic chart for Federal’s P3006P 150-grain Ballistic Tip. The distance to the target is 400 yards, and there is no crosswind. Look at the ballistic chart, and see that for a 400 yard target, the elevation is 1.92. If there’s a crosswind, you use the same principle. 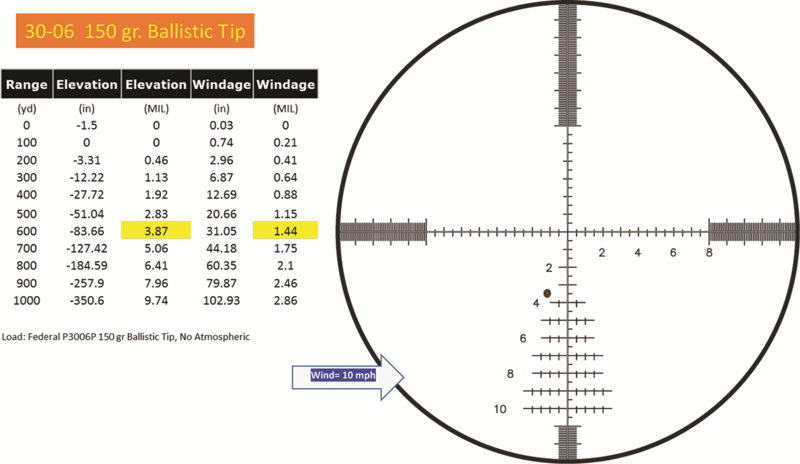 In the second image of Bushnell’s G2 reticle (this page), the shooter has selected a 600 yard target, and there’s a 10 mph breeze from the left. One more note about these mil-based reticles: unlike more traditional scopes, the turrets and dials are elevated, and thus, exposed. That means you can adjust the dial instead of holding over and off. If you saw the movie “American Sniper,” you saw actor Bradley Cooper, playing Chris Kyle, adjust his scope in just this way. 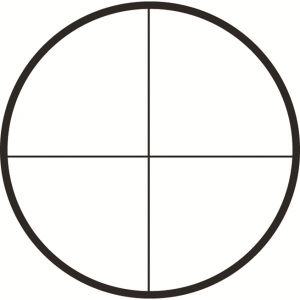 Regardless of what kind of shooting you do, you can find the right scope with the right reticle. With three levels of complexity available, you can choose from simple crosshairs to a sophisticated front focal plane reticle that will be more accurate than you are.